For anyone interested, I have finished coding and deployed to the Apple AppStore a “Traditional Latin Mass” finder (TLM Finder). It finds the closest Latin Masses based on your location (or via a search), currently in the United States. You can tap information in the TLM Finder to call the church, visit the church’s website (if available), email the church, or navigate to it (that feature goes to the Maps application). I will be adding more countries going forward, starting with Canada. The Traditional Latin Mass Finder should be downloadable via any country’s Apple AppStore though. The link for the webpage is HERE. The AppStore link is HERE. The TLM Finder is free to download and use. It is supported with iAds. 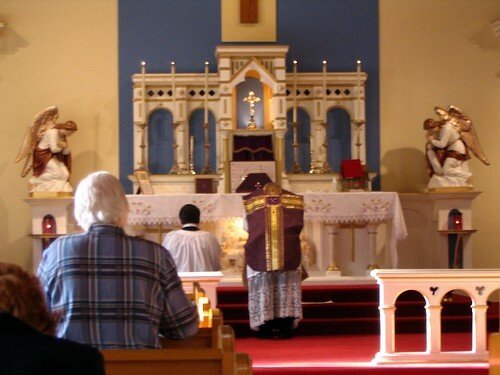 While I only have compiled the Latin Masses for the United States of America so far, if you live elsewhere please send me the Latin Mass you attend, and I will get it entered into the app’s data as soon as possible! That way I will slowly start building up other country’s data. Also, if you have additions or corrections, please follow my website link above and email me, and I will gladly enter them. Please provide contact information (websites, phone numbers, etc), as I will need to verify the Mass before adding it to the data. This is version 1.0 of the app, so if you find bugs please report them via my website, or leave feedback in the AppStore. Lastly, if you know anyone who would be interested in the TLM Finder, please forward my website to them! This entry was posted in Catholic, Culture, Tech News, Theology and tagged Catholic, Catholic Church, Extraordinary Form, Latin Mass, Latin Mass Finder, Traditional Latin Mass, Traditional Latin Mass Finder. Bookmark the permalink.